I hustled the kids out of the house, screeching at them to get in the car, and buckle their seat belts, “We have to go to school! Please! Let’s Go!” I grab my laptop and purse, forget my keys, run back to the house, then back to the car. Plop down in the driver seat, start the ignition, and click on the windshield wipers. They made the grating sound of heaving their way across the ice on my windshield. I hauled myself out of the car, looked into the trunk and found the tool I needed. I gave up any hopes of getting the kids to school on time, and dutifully cut the ice from my car, one lunging scrape at a time. Cold weather has a way of slowing us down. A much needed forceful hand guiding us to take note of what matters. The time we take fro granted so easily slips away from us in the wind, in the schedules, and the iMacs and the double shifts of life. We watch today’s versions of ourselves and our children disintegrate during the night. We wake to find we are all new people in the morning. In new light, it seems I have given up coffee and the children no longer needing help tying their shoes. This is what we want as parents – children who will grow up to forge lives of their own. Sometimes, I fear we desperately document moments we only know through iPhone photos and not necessarily because we were mentally present to bookmark the memory in our hearts. stock up on what we need for the winter. I keep loaves of bread in the deep freeze to be at the ready when the desire for soup comes. Soup isn’t soup without crusty bread. It just isn’t. 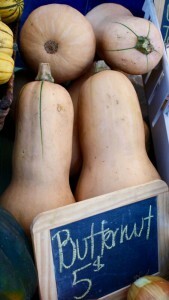 Potatoes and hard-skinned squash like butternut, spaghetti and acorn will keep for months. Maple syrup and honey will keep indefinitely, so I buy enough to get us through the winter. We returned home to resume life in all its hectic wonder. 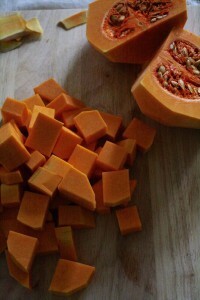 Later that evening, I made myself a cup of tea, and rested the butternut squash I’d bought the week before from Tyler at Botna Burrow Farm on the cutting board. While I slowly sliced the skin from its orange flesh, I vowed to do better tomorrow and found myself thankful for squash stew and ice on windshields. Heat oil in a Dutch oven over medium heat. Add onion, spices and bay leaves. When the onions soften, after about 5 minutes, add the garlic. Sauté for about 5 minutes more, then add the carrots, and a 1/2 cup of water. Cover and let them cook for 10 minutes. 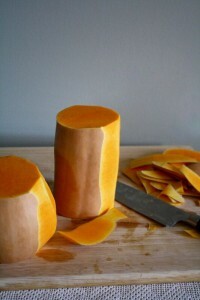 Add butternut squash, tomatoes, and chicken stock. Give it a quick stir, cover and cook on the stovetop for about 30 minutes. Pour yourself a glass of wine. Read a magazine. When 30 minutes is up, add the lentils. Cook for 30 minutes more, then add salt, and freshly ground black pepper to taste. Remove the bay leaves. Toss the kale leaves into the soup pot. They are ready when softened a bit and the color brightens. This should only take a minute or two. Ladle into bowls, drizzle with olive oil and top with freshly ground black pepper. 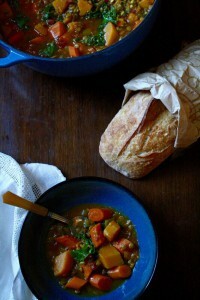 You can easily make this dish vegetarian, by substituting the broth for water. I also like to squeeze lemon juice into my soup, because I love sour and spicy together. It’s up to you. To learn more about Summer Miller and her recipes visit the link below!